Today’s MLB is full of tankers and contenders. The 2013 Astros won 51 games in the whole season. The 2017 team already has 48 wins and it isn’t even July yet. This is an era of tanking and rebuilding in baseball. Teams like the Cubs and Astros drop into the cellar for a few years, stockpile talent, and then burst back into first place, stronger than ever. Never before have teams so consciously chosen between contention and reconstruction. 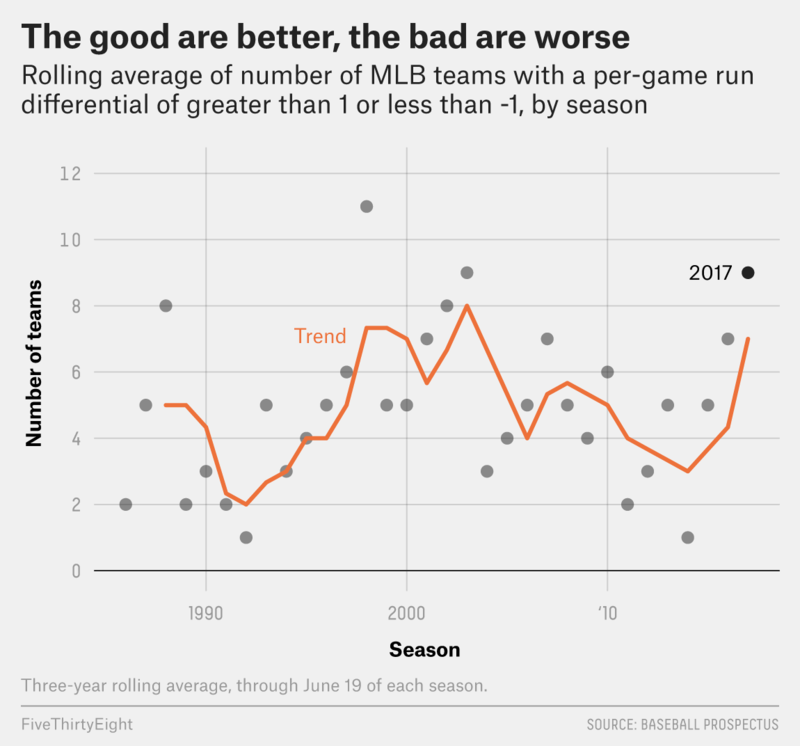 The ebb and flow of teams through the competitive cycle has left the league less balanced than it has been since the steroid era. To get a sense of the level of parity in baseball, I calculated the standard deviation in run differential at this point in each season going back to 1988.1 When the league is less even, the differences in run differential between teams tend to expand and the standard deviation gets larger. Over the last couple years, imbalance in the league has spiked. The last time parity was lower than it has been the last two seasons was in 2003, when Barry Bonds could still be counted on for at least 40 home runs a season. Six teams are on pace (by run differential) for 97-win seasons, while four threaten to lose 97 games. It’s obvious how uneven the league is now when you look at some of the most impressive teams of 2017. The Astros aren’t quite on the historic run that the Cubs managed last year. But they’re close — after 72 games, the Astros project to finish the season with a run differential of +254, slightly better than the impressive rate the defending champions managed last year. The Astros also have company at the top: The Yankees are just off Houston’s run-differential pace — riding unexpected performances to a strong bid for the division crown. In the senior circuit, the Dodgers are relying on league-best run prevention to power an equally impressive performance. Three of the top six teams in run differential (the Dodgers, Diamondbacks and Rockies) play in the National League West, a surprisingly competitive division that also hosts two of the worst teams in the league. Speaking of the Padres, MLB’s worst teams have committed wholly to rebuilding, at the cost of any shred of competitiveness. While the Padres’ management doesn’t dare speak the word, executive chairman Ron Fowler said last year that they aimed “to get to .500 in hopefully” 2018. From trading established stars to turning single-A players loose on the field, the Padres have abandoned the idea of contention. That’s an amazing change of fortune for a team that went all-in two years ago, only to fall short. The Phillies are similarly terrible, having traded away their stars in an effort to tank. Many of these teams won’t finish the year with run differentials as woeful or as impressive as what they’ve posted so far (Rockies, I’m looking at you). The Astros are unlikely to keep up their historic pace, just as the Cubs ultimately fell off their record-challenging midseason pace last year. But the relentless churn of teams willfully plummeting to the bottom and then rising again with fresh talent ought to keep baseball a league of haves and have-nots for the foreseeable future. To make the standard deviation less noisy, I used a week’s (June 13-19) worth of games in each season.